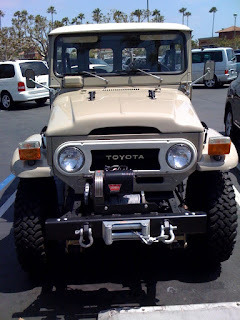 Found this gem of a Toyota FJ40 down at the Poinsettia Plaza Ralph's (The World's Most Expensive Grocery Store (R)) a couple of weeks back. All of these disappeared into clouds of iron oxide in the Midwest decades ago. When living in Boulder I had the chance to buy a solid 1973 example from a neighbor for the whopping sum of $2000. Faded baby blue paint and a brake system that needed an overhaul, but complete, straight and rust free. Every time I see one of these on the road I kick myself for passing on the opportunity. 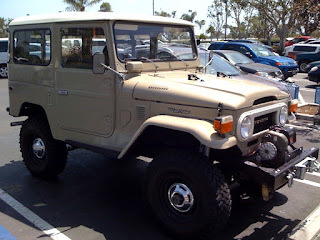 Sure looks better than the numerous FJ Cruisers that call North County home.